Numerous financial experts and market participants have been warning that the cryptocurrency market may be a bubble. They compare it to the dot-com bubble of the early 2000s or the tulip mania of the 17th century. Warnings are abound that cryptocurrencies will end just the same. Doomsayer predict even worse repercussions than those of previous bubbles. These types of predictions are common every time new technologies enter the market, on account of their disruptive nature. However, let’s take a closer look at the dot-com bubble and its outcome. Deflagration of economic bubbles always carries the opportunity for consolidation, paving the way for solid and stable growth. Subsequently, only those companies and technologies that have true potential stand a chance in the long term. For instance, take Amazon after making IPO in 1997. The initial stock price was USD 1,40 and rose to an astounding USD 113 in December 1999 when the dot-com bubble hit its peek just a few month before bursting. In October 2001, Amazon lost 95% of its value and stood at USD 5,51. Nevertheless, the company from Seattle has put in solid and stable growth since to become one of the world’s most successful companies. As can be seen, USD 10,000 invested back then into Amazon stock would be worth USD 3 Million today. So what is the lesson to be learned from this? Instead of reductive talk about a bubble regarding all cryptocurrencies, we should bear in mind first and foremost the chance of new developments and new business. To quote Christopher Giancarlo, US chairman of the Commodity Futures Trading Commission (CFTC): “We owe it to this new generation to respect their enthusiasm for virtual currencies, with a thoughtful and balance response, and not a dismissive one.” So, this holds true for blockchain technology and the cryptocurrency market. Blockchain technology is set to change banking technologies. In this context, only cryptocurrencies like PURA that bring decisive advantages to the mass market will survive. 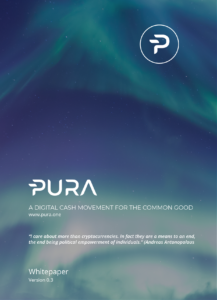 Above all, fast transaction times, steady work towards mass adoption, choosing the right partnerships and continuous technological development are the hallmarks of PURA that will prove to be critical and game-changing. To stay on top of all developments, make sure that you follow our PURA Telegram group. Simply install Telegram on your desktop and join in.